The second-year receiver is calling on the support of teammates and memories of past adversity to move on from the last play of Sunday's game. An NFL season that has seen him get his first significant playing time has mostly been “one heck of a ride,’’ Seattle receiver David Moore said Thursday. The first real detour into unexpected territory came last Sunday, when a pass thrown his way on the final play of the game also veered just a little off-course. Moore flashed open in the back of the end zone on an untimed down from the 6-yard line Seattle was granted following a defensive pass interference penalty and had his eyes on a pass from Russell Wilson until, roughly 2-3 feet before it got to him, it was tipped by Chargers safety Jahleel Addae. That’s the message all involved — coaches, teammates, family — have sent to Moore this week as he deals with his first real piece of adversity during a season in which he went from a seventh-round pick who spent almost all of last year on the practice squad, playing in only one game, to a member of Seattle’s starting three-receiver rotation. Even though he realized immediately the ball had been tipped, Moore took the play particularly hard. 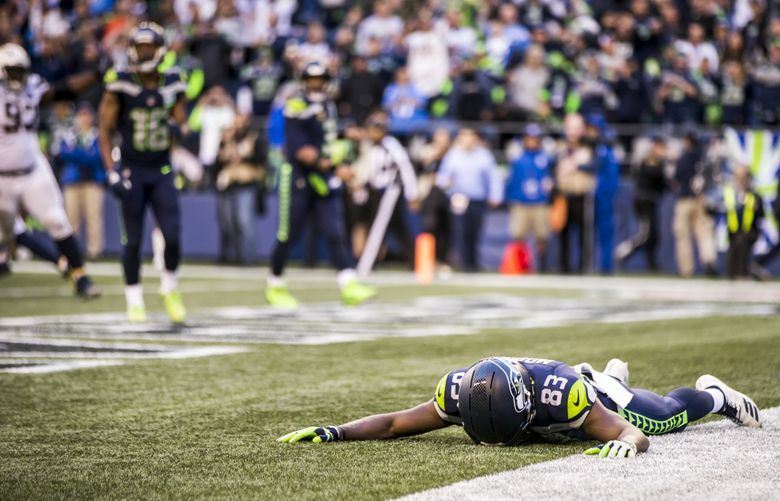 Moore lay face down in the end zone as he saw the ball — and a potential tie game in what would have been rather miraculous circumstances with Seattle having trailed by 15 inside the final two minutes — get away. He was then shielded from reporters afterward by veteran teammate Doug Baldwin (Thursday’s comments his first on the play since the game) and once home decided not to look at the play that night. Watching the replay at least confirmed to Moore that there wasn’t a whole lot he could have done other than somehow hang on to a catch that has a very low percentage once tipped. And maybe Moore would kick himself more if there was something he could have done differently to prepare for such a play. But there’s simply no way to really replicate catching a fastball of the type that Wilson threw that was then tipped so close before it reached him. Moore had also done exactly as told on the play, running a crossing route in the back of the end zone, continuing on as the play called for as Wilson dropped back and then moved up in the pocket. Addae, in fact, was covering Tyler Lockett, who came across from the other direction. If Wilson had thrown the just a tick sooner, or Lockett gotten there just a tick later. …. Moore also has drawn on the memory of a tough stretch during his senior season at East Central (Ok.) University. That’s the difference — this game was seen by millions, and NFL games tend to live on forever among a team’s most ardent fans. But proof that he was taking the team’s just-move-on approach to heart seemed evident as Moore talked about the play and its aftermath for five minutes or so with reporters Thursday. He said he understands that playing in the NFL means the spotlight is always on, hopefully more good than bad, but that when the bad comes the trick is to be able to flush it quickly in confidence that another similar chance will come again.